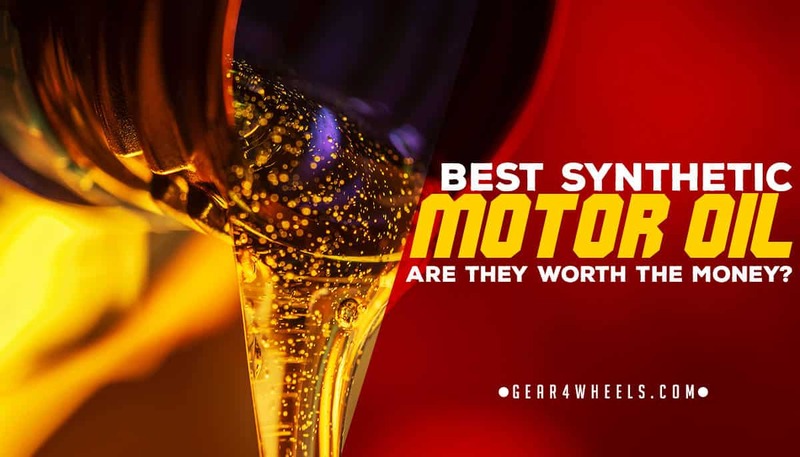 Best Synthetic Motor Oil 2018 [Reviews] Are they worth the money? Finding the best synthetic motor oil for your car can be a tricky task. I’ve spent hundreds of hours investigating the oil market (and done hundreds﻿ of oil changes myself) andI have combined my knowledge on motor oil with the thousands of customer reviews from a lot of top-of-the-league synthetic oils to craft this list. I've added a comprehensive buyer’s guide that is an absolute MUST read in order to help you understand which oil to buy for your car in particular. Made with the best additives available for superior sludge protection. Almost every single thing about it. Specifically made for heavy-duty engines. Made for High Mileage engines. Impressive Pack of Additives that act manyfold to keep your engine running like new. Very affordable, since it isn’t full synthetic. Great performance on Heavy Duty Engines such as truck or van big diesel engines. ​Here are the best all around synthetic motor oils to keep your vehicle running smoothly. For the lowest SAE of the table we have selected Valvoline SYNpower. Valvoline is a 100% american oil company, the oldest in the country and SYNpower is their highest line of products. There are other good alternatives but this is in our opinion the best 0w20 available. Top quality detergents on this oil help dissolving existing sludge and prevent new sludge formation. Offers great varnish protection and outstanding high-temperature protection under severe driving conditions and superior cold-temperature protection through faster oil flow at start-up. Although greater fuel efficiency is claimed, we have no personal records of that being true. 0w20 is usually the recommended SAE in most hybrid and small-sized gasoline engines. Here’s Valvoline again, and there are good reasons! In general terms, the SYNpower oil has very few contenders. Sure, there are grades in which we find better oils. We like Valvoline but we’re no fanboys. For the 5W20 SAE we believe is the best full synthetic oil. SYNpower oils are made with Group IV stock base oils and top quality detergents that offer great sludge protection as well as great varnish protection. At high temperatures it still provides great protection despite the low viscosity, and it also offers great cold-start protection when the hydrodynamic lubrication is poor thanks to the faster oil flow. Royal Purple is a premium manufacturer and their products are some of the very best on the market, both on synthetic oils and oil filters. They do also produce performance additives such as fuel injector cleaners that are worth having a look at. This particular oil is heavily recommended among the rotary community. Rotary engines are (in)famously known for relying heavily on good oils. It is specifically meant for use on gasoline engines. Whilst you can use it on diesel engines, we would advise to check #4 in that case. It is recommended a full break-in before switching to royal purple. On high-mileage engines, it is advised to do a few short mileage oil change intervals (such as 3000miles) when switching to royal purple to allow it to dissolve sludge deposits properly. It is a great oil if you usually run fuel containing ethanol, given its superior compatibility. Increased fuel efficiency has been proved when changing from other brands to RP. It is made from Group IV (PAO) base stocks. Pennzoil is owned by Shell since 2002. Ultra Platinum is the highest line of products they manufacture for which they use Group V base stocks (natural gas) This is, the base used is 99.5% pure. On top of that, the additives used ensure the highest possible levels of engine cleanliness. It increases fuel economy and ensures the best lubrication on cold temperatures. Even if priced cheaper than the competition, it is still an expensive motor oil. For cars using 10w30 oil on their engines we recommend Pennzoil Ultra Platinum. As we’ve seen on the 5w30 review, it is a full synthetic oil made from from natural gas as a base stock, with a combination of additives that ensure cleaner pistons, better fuel economy and helps protect engines from metal wear caused by friction resulting on loss of power. It provides faster low temperature oil flow thanks to its extremely pure (99.5%) base stock. So again, we have a motor oil that meets or exceeds the vast majority of industry standards, from Dexos 1 to ACEA, including dozens of vehicle manufacturer’s own standards. Whilst this SAE isn’t very commonly used, there are performance engines that require the best from both worlds. Very fluid low temperature oils that are thick when hot and offer great protection vs friction. A good lot of Porsche engines as well as BMW engines run with 0w40. The debate has been lately “Castrol vs Mobil 1” and after listening to the community, we believe Castrol makes the best 0w40. Overall engine noise sees drastic reduction when using Castrol Edge. It meets the toughest industry standards such as BMW LL-01, Mercedes-Benz 229.5 and 229.3, Porsche A40, VW 505.00 and 502.00, Ford WSS-M2C937-A, PSA B71 2296 and it is API SN/CF, ACEA A3, ACEA B3, ACEA B4, A3/B4 certified. This full synthetic motor oil as proven itself and is now the reference. The Shell Rotella T6 is an oil meant for heavy duty diesel engines. These engines have the highest lubrication demands, therefore being extremely important to use only the best synthetic motor oil. It uses Group III Base Stock, which means it isn’t a full synthetic oil. In Europe, this mixtures are called “Semi-synthetic oils” since they use conventional oil as a base but the combined additives provide higher performance, as good as a full synthetic motor oil, but not as expensive. Here's an article about where does synthetic oil come from. The additives Shell uses on the Rotella provide with reduced levels of ash, phosphorous and sulfur to help maintain the efficiency of the latest vehicle-emissions technologies, making it very DPF and EGR friendly. It is based on free-flowing synthetic base oils that allow reliable pumping on start-up under cold climate conditions yet remain thick enough under high temperature operation to protect against wear. It meets the following specifications: API CJ-4.Volvo VDS-4, JASO DH-2, JASO-MA, VW TDI 504.00, MB 228.31. The last Valvoline from the list. This time is not the SYNpower full synthetic because... they don’t make it for this SAE! (they do, but is motorcycle oil and it is EXPENSIVE) For cars, the MAXlife is the deal. It is meant for engines with high mileage. It is made from a mixture of base stocks that don’t make it a full synthetic oil (hence called synthetic blend). It carries an impressive pack of additives such as seal conditioners that rejuvenate aging engine seals to help stop and prevent oil leak and extra detergents that keep older engines cleaner by bonding with and removing sludge and deposits and then anti-oxidants help prevent oil breakdown, preventing engine-clogging sludge and deposit formation. As every Royal Purple oil, it is full synthetic. The bases used are specially compatible with fuels containing ethanol. It provides better wear protection than the competition, superior corrosion protection and meets some of the highest standards for heavy duty machines such as Cummins CES 20081, DDC Power Guard 93K18, Mack E0-0 Premium Plus, Renault vl RLD-3 and Volvo VDS-4 engine oil requirements. It also meets CJ-4, ILSAC GF-5 and Dexos1. Sadly, Royal Purple products carry a higher price than the average, it couldn’t all be good! Sometimes the 5 gallon jugs are a bit short on content. Contacting RP Customer Service should solve it though. The German company LiquiMoly is in general terms one of the best brands in automotive lubricants. However they are rather expensive and not always to recommend. For most common SAE grades other brands procure with top performing oils at a more affordable price. But when we talk about a SAE 10W60 we talk about performance engines with incredible requirements on oil viscosity, give as an example all M series of BMW, most Porsche engines and so on. In fact, LiquiMoly is the recommended oil for most premium German automotive brands. The obvious downside it is that it is expensive, but if your car asks for a 10w60, this is what you want. Don’t save 10$ on the oil of a 8000$ engine. This guide is meant to help you make an educated choice on synthetic oil for your car. To help you understand the different grades, oil bases, additives, and much more. We cover why synthetic oil is the smart choice, what brands are out there, which synthetic oil should you get for your car, the consequences of using the wrong oil and we also link to some other resources that we’ve developed to help you further in your car maintenance. We hope that this guide covers all your possible doubts and if it doesn’t please send us an email to [email protected] telling us what you feel we are missing. Is synthetic oil better than conventional oil? Which synthetic oil should I use in my car? Quick Answer: The oil you car’s manufacturer recommends for your model and motor. End. Is using the wrong oil bad for the engine? The Right SAE for your car. What happens if I use a different SAE. So yes. Synthetic oil is way better than conventional oil in all terms and it is a very smart investment to use synthetic oil in your car. If that’s enough of an answer to you, go to Amazon (they will give you better prices than your local store/garage shop) and buy whatever your car’s manual say and call it a day. Honestly, you will be ok. This first answer might surprise you. “It can’t be that easy!” you might think. Longer Answer: Considering the manufacturer’s recommendation (let’s say your car’s manufacturer recommends Mobil 1 5w40) have a look at other 5w40 full synthetic oils out there and see which one has the best qualities and offers the most value for your money. And to spare you precious time, we’ve done the research already and that’s what you see on the table that’s on top of this page. Now, should you use a different oil, like let’s say a 0w20 because uncle Bob told you that “It is better for the climate here son!” ? No. You will most likely end up facing severe mechanical problems. So keep reading. Like most things, it depends. Let’s see on what. Multigrade oils (most oils) have two numbers. The 1st number, or the “Winter” number, measures the viscosity of the oil on cold conditions. Usually, the lower this number is, the more fluid the oil will be under low temperatures (see on the chart on the left how a 0W has a longer arrow than a 20W indicating proper fluidity under lower temperatures) so, the better. The second number or “Weight” shows the thickness of the oil once this is at high temperature. The higher the number, the thicker the oil will be at a determinate temperature. Now does it mean that the higher the better? Not necessarily. Not all engines were created equal. Whereas lower Winter grades are generally better (making cold-starts easier and providing proper lubrication even on extremely cold environments) higher weight is not always better. Every engine will have different lubrication needs at the optimal operating temperature AND different operating temperatures. For instance, a big, turbocharged diesel engine will generally operate at very high temperatures, high pressure and require then better performing lubricants. A small, atmospheric gasoline engine will do better with a thinner oil on high temperature. A Winter grade too high will cause bad lubrication on cold (roughly the first 30 minutes your car is running) increasing metal wear and making cold starts a hard thing. A weight grade too low will cause the oil film in between moving parts to be too thin, increasing friction, temperature and metal wear. It will be likely to get into the cylinders through the piston rings. Oil consumption rises by burning oil in the combustion. Burnt oil will quickly damage the catalytic converters and may cause malfunction on the lambda sensors. A weight grade too high will be harder to pump and hydrodynamic lubrication will be lower. Oil resistance increases and the performance decreases. MPG decreases. Turbocharged engines are very sensitive to operative temperature thickness as the turbo shaft revolves at over 100.000 rpm being its lubrication needs extremely high. Their lifespan depends entirely on the correct quantity, density and viscosity of the oil. Diesel engines that incorporate DPF and or EGR systems, those will be affected by the gases that the oil generates, wrong oil, wrong gases will go to the components. You can learn more about oil viscosity here. For that question, we’ve written an entire article on synthetic oil ﻿﻿change ﻿﻿interval, with hopes to bring some light to the topic. Synthetic oil has got overall a much larger lifespan than regular oil so the traditional “change oil each 3000 miles” recommendation is nowadays rather obsolete. Whenever you change oil, change the oil filter too. It is worth very little to get new immaculate oil in your engine if your filter is all dirty. Filters are usually inexpensive and are a vital element on the lubrication system. They retain all the nasty stuff that gets into the oil such as metal particles product of metal wear, dust, combustion by-products such as soot, acid and water. Changing the oil filter is essential for a correct lubrication and condition of the oil. We’ve also done a full review on the best oil filters so we recommend you to check that too and buy your oil and filter together. It shouldn’t. Properly formulated synthetic oils will generally not cause an engine oil leak. Synthetic oils are usually more fluid and even when old, they run smoothly. They have a higher degree of natural solvency. This may clean and remove existing deposits of sludge left previously by conventional oils. If some of these deposits are blocking damaged seals or cracks, leaking may happen. If your engine already experiences a high oil consumption that problem should be tackled prior to switching to synthetic oil. If you check our ten recommendations you will see just a few brands in the list. It doesn’t mean that other brands make bad products but we believe that brands such as Valvoline or Liquimoly are at the very top of the league. And here is why. The oldest motor oil marketer in the United States, Valvoline, it’s been around since 1866. It is part of Ashland Inc. a fortune 500 company. Every Valvoline product is designed and manufactured 100% in the US. It was Henry Ford’s oil of choice and every Model T had Valvoline as the factory fill oil. It has been around since cars are cars and that says enough for us. Founded in Los Angeles in 1913 (long ago!) it has passed by many hands, being now part of Royal Dutch/Shell. Pennzoil play is to make oils that help maintaining your engine spotless from the inside. The Platinum series are meant to clean sludge and other nasty buildups. The less sludge, the better performance of the engine. They’ve made great effort in promoting the brand and are now Ferrari’s oil of choice. This guys haven’t been as long in the game as Valvoline or Pennzoil (they were established in 1986) and aren’t as-well known, but definitely are serious players. They produce full synthetic motor oils that are, guess what, purple in color, got a US federal trademark for the exclusive use of purple containers for lubricants and produce all kinds of oils, from motor oil to transmission oil to hydraulic oil. The company has grown strong and steady over the years and is known for performance upgrades and fuel economy gains when switching from other brands to Royal Purple. German engineering has always been the finest of its class and it’s no difference when it comes to engine oil. Founded in 1957 they are Germany’s #1 additive manufacturer and one of the most awarded oil makers. Their first product, Molybdenum disulfide is the brand’s name origin. Liquimoly excels at producing high-performance motor oils aswell as transmission oils and differential oils. We almost kicked out Shell off our list due to this thing and this other thing. But they DO make great oils so we’ll leave environmental issues aside for a minute. Royal Dutch Shell is an Anglo-Dutch company, the world’s second largest oil company and one of the world’s most valuable companies. Their heavy duty engine oils and specifil diesel oils are a sure bet and therefore they’ve made into the list. Synthetic oils will give your engine’s components more than enough protection if you’ve picked the right viscosity oil and a good, trusted product. By respecting the right synthetic oil change interval you extend your engine's operative life. Just make sure to bring the used oil to somewhere like Wallmart or Autozone (most places that sell oil will accept used oil for disposal) and enjoy many more miles on your car! Great page but i need a low ash C2 rated oil because of the DPF in the exhaust. What 5W-30 oil would you recommend? Also in what order would you rank the following brands of oil; Fuchs, Mobil 1, Millers Oils, Shell and Castrol. Particularly as not all the brands you mention are available in the UK. When it comes to DPF filters I tend to go with what the manufacturer recommends (unless I know what the original oil is, this is to say that maybe XYZ manufacturer uses their “own” oil which is in fact Castrol or Valvoline re-labeled, for instance). DPFs are no joke in Europe and manufacturers tend to wash their hands if the DPF goes wrong before the scheduled maintenance swap and the car hasn’t passed each scheduled maintenance visit at the OEM’s garage, and some other warranty issues could happen aswell. Maybe with a make and model I could ask around to some peers in the UK who work for OEMs and give you a more useful answer. Regarding those 5 brands, Castrol and Shell are in the top tier, Fuchs (can’t say the name loud or I laugh) is indeed a superb oil, I believe it’s OEM for the M series? It’s got really good endorsement from hi-end Japanese car owners (GT-R) so, considering I haven’t tried it myself, I’d still put it up the chart from all the good things I’ve read about it. I reserve my opinions on Mobil 1… GREAT filters though. Millers seem to be good at marketing with misleading dyno tests and fancy claims on performance % upgrades, but I’m not buying. Thanks for the reply. Handbook only mentions using 0W-30 or 5W-30 oil and B1 grade (the latter part is apparently out of date hence the C2 low ash recommendation) but no preference when it comes to branding for the Toyota Auris SR180 stated. My local mechanic would use SRS fully synthetic oil for this vehicle if given for a service but I’m not familiar? By the way, on a 180bhp car are there any performance gains to be had by using a premium ester oil like Red Line? Based on your recommendation I would get the Mobil 1 M1 oil filter but it’s too hard to obtain on this side of the pond. If there’s not much in it I’ll most likely order Mahle fuel and oil filters for the next service. I’ve never used or have any affiliation with Mobil 1 but why has their oil got your goat?! So, made a quick check and here are the options I see for your specific model. Valvoline is the most expensive from that selection from what i’ve seen. All of them great choices, at this moment it’s up to you which one to take from that short list, they’re all going to perform as you need. On a side note, I’d go for 5w-30 if you enjoy yourself with the pedal and now that winter’s over, I don’t see the benefit of a thinner oil. I have no problems with mobil 1 haha. It’s justcompetitors have evolved in additives better than they have had and right now there are far better choices. Like, you could use Mobil 1 ESP for your car, it would meet C2, blabla, yet I don’t see a single reason not to go for a slightly better brand. Their wear tests (independent sample tests) have come with weaker results than those… So yeah. And just to be clear, I do not have any affiliation with any oil brand whatsoever. I said it on my about, but I thought important to say it again. Just to be clear aswell, I don’t own a laboratory so my recommendations are based on gathering industry data here and there, asking peeps in the engineering space, my own experience from doing oil changes and seeing all sort of weird things, etc. Almost forgot. About performance gains. Nope that’s never the case. You can only have less performance losses. We tend to think our car is giving xyzBHP just as the manufacturer tells, but every single component that’s performing sub-par will bring the number down. Regarding oil, you do want to go as highest quality as you can afford for performance to stay consistent during the years. I do hope this helps Shane! Would you recommend Valvoline Sny Power 5w 30 for a 20016 Land Rover Range Rover HSE with Ford / Jag 4.4 V8?